Any business owner who may be at risk of litigation by customers or employees should consider protection from claims against business assets. There are a variety of corporate structures available for business owners to use that may make it difficult or expensive for someone to make such a claim. Both corporations (C Corp and S Corp) and limited liability companies (LLCs) will shield personal assets from claims arising out of actions against a business. But there are differences between them. What is charging order protection? 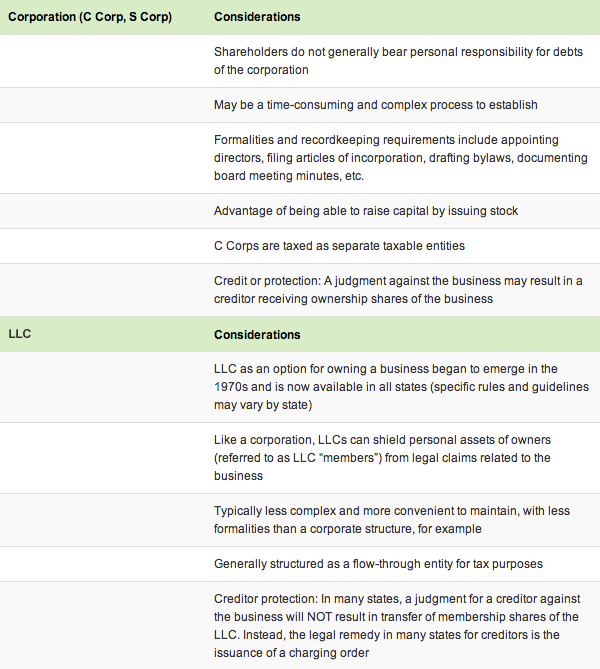 A key difference between corporations and limited liability companies is charging order protection, where actual ownership interests in a business are protected from creditors. For example, instead of receiving shares of the business as part of a legal judgment, the creditor can only access distributions from the LLC. If the LLC has been established properly, its members can have the flexibility of not making any distributions in a case where a creditor receives a charging order. This will generally prompt the creditor to enter into negotiations with the business owner on settlement terms that may be less desirable to the creditor. In this type of situation, the business owners (i.e., LLC members) have not avoided the risk entirely, but are essentially ready to negotiate from a position of relative strength versus weakness. Charging order protection may also apply in the case of limited partnerships such as limited liability partnerships (LLPs) and family limited partnerships (FLPs). It’s important to note that state laws vary widely and that certain states will not consider charging order protection as the sole legal remedy in these types of legal disputes. Therefore, business owners must consult with a qualified legal professional with specific knowledge of state laws.